For churches who prefer the beauty and accuracy of the New Revised Standard Version of the Bible, inexpensive but high-quality editions have been difficult to find. Until now. 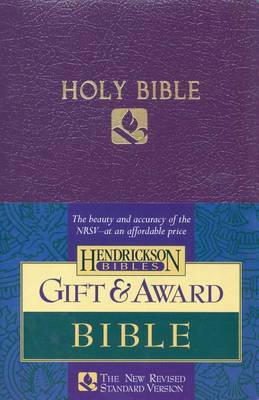 Hendrickson s new "NRSV Gift & Award Bible" combines thoughtfully designed features with a surprisingly affordable price. Boasting better-grade paper, clear and readable type, three pages of updated color maps, and a presentation page, this is a beautifully crafted Bible as well as the most affordable one on the market. Great value at a budget-conscious price Six attractive colors black, royal blue, burgundy, green, royal purple, and white suit any occasion Imitation Leather, 912 pages, 5 1/2" x 8 1/2" Color maps and presentation pageOther NRSV award Bibles on the market may look good, but aren t designed to be actually read. This handsome award Bible will withstand heavy use, thanks to its better-quality paper and supple but sturdy cover material. Shipped with an attractive four-color half-wrap and shrink-wrapping"